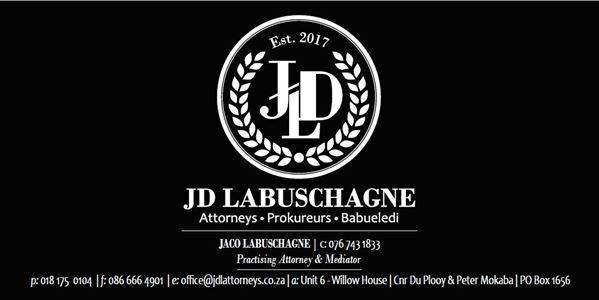 JD Labuschagne Attorneys is passionate about making our client's business our exclusive and top priority. Divorce, Divorce Mediation, Matrimonial, Deceased Estates, Wills, Family Law, Mediation, Litigation (Civil). Access to Children, Antenuptial Contracts, Childrens Rights, Civil, Commercial, Commercial Drafting, Contracts, Custody, Deceased Estates, Divorce, Divorce Mediation, Domestic Violence, Employment Law, Estates, Evictions, Family Law, Firearm license applications, Labour Law, Litigation (Civil), Maintenance, Matrimonial, Mediation, Pensions and Retirement Funds, Provident Fund disputes, Retirement Fund Law, Sale of Business, Sectional Title, Trusts, Wills.